You wanted more, and you've got more! The Madison Comic Con is back and even bigger than ever! We're still at Monona Terrace, and we're taking over their Exhibit Hall there with more space, more vendors, more artists, more guests, more everything! This is one show that you won't want to miss! 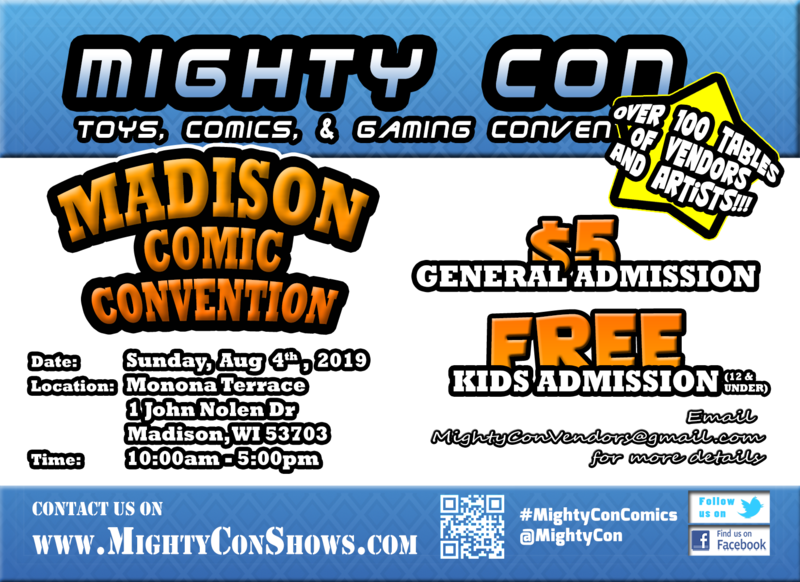 The Madison Comic Con takes place Sunday, August 4th from 10:00 a.m. to 5:00 p.m. Adults are just $5 for a full day of fun, and kids 12 and under are FREE. But you don’t just get admission for that. Every person who attends Mighty Con gets a free comic book at the door to get their day started off right. Vendor booths and artist tables are available now, so reserve your space before they disapear! If you have any questions, just reach out to our vendor coordinator at MightyConVendors@gmail.com! We’re always looking for new artists and vendors, so come on out! Click Here To Order Your Tables For This and Other Shows! Q’s Quellectibles Sells a wide variety of retro video games, board and card games, Funko Pops and action figures.